This is one of those books that will change you if you give heed and listen. The voice of culture tells us to grow and build exponentially. It occurs in our Christian culture as well. We are impressed by the one who has amassed the most followers. The problem with this mentality is that it completely denies the descending way of Christ. He drew people in to serve them and renew their hearts. Right out of the gate, Gordon takes us into addressing the sin of his own drivenness as a pastor. What a refreshing thing to see a man in a high profile position allow his heart to be taken to task by the Holy Spirit. God convicted him of the many ways that he had been moving in his own power and agenda. He was doing it at the great neglect of those closest to him. Gordon lays out some simple ideas that can change how you relate to God and others. We can do quite a lot by being teachable and learning to truly listen to others. There is even a section about how to listen to your critics and pray through what they tell you. Wouldn't it be great to be able to receive from the Lord even when people don't say things well? He tells us to ask God to show us truths in the hurtful ways people tell us things. What a freeing response to discuss things with Jesus over carrying unnecessary pain from their words. Disclaimer: You know that once I tried to start implementing much of what Gordon said and change up my devotional routine to be with Jesus more that all of my kids started throwing up, being sick, and having nightmares. I did what I could and I keep pressing on toward the ultimate goal (without being angry that I have been given a heart to serve my children). Don't give up. Keep pressing in. He wants to make you more like him. Thomas Nelson Publishers for review. We have schedule planners, computerized calendars, smart phones, and sticky notes to help us organize our business and social lives every day. 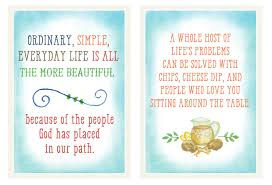 But what about organizing the other side of our lives?the spiritual side? 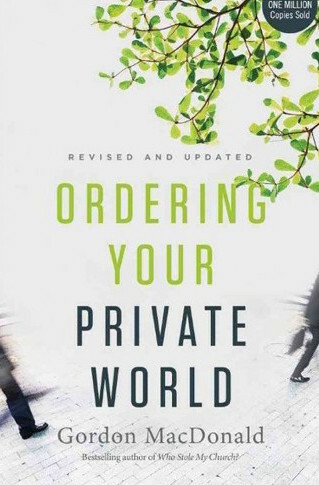 One of the great battlegrounds is within the private world of the individual. The values of our Western culture would have us believe the busy, publicly active person in ministry is also the most spiritual. Tempted to give imbalanced attention to the public world at the expense of the private, we become involved in more programs, more meetings. Our massive responsibilities at home, work, and church have resulted in many good people on the verge of collapse. In this updated classic Ordering Your Private World, Gordon MacDonald equips a new generation to live life from the inside out, cultivating the inner victory necessary for public effectiveness. Oh how I loved this book. The story deeply touched my heart. 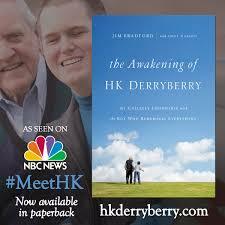 It all started when fifty-five year old Jim Bradford ended up in a diner on a Saturday morning looking for coffee. It was a place he never really went to, but somehow ended up there that morning. He noticed a small boy sitting in a booth all alone. He began inquiring about him and went over to speak with him. After leaving the restaurant, Jim couldn't get HK out of his mind. He went back repeatedly to visit with him at the diner. Eventually, the two of them became best friends. HK's grandmother and caregiver allowed Jim to take her grandson out to church and to eat. Jim saw to it that HK's needs were met. 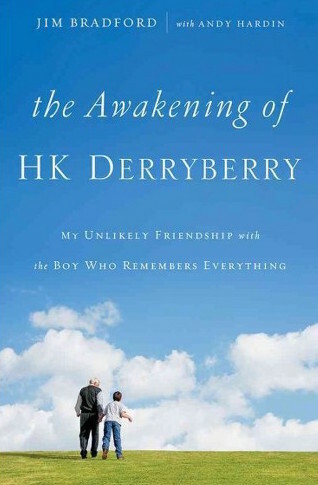 His blindness and Cerebral Palsy were no match for his charm and caring heart. I hope that you will read this book or read about the story. Jim stepped straight into the fatherless generation and made a difference. HK has gone on to do amazing things as well. You'll see how his personality has garnered him much attention. He has befriended many celebrities, flown a plane, ministered to the homeless, given inspirational speeches to thousands. It's amazing what you can do when someone loves you. I highly recommend this book. Both of these men offer us such hope. Good people are out there. They are quietly loving others behind the scenes and making the biggest difference. 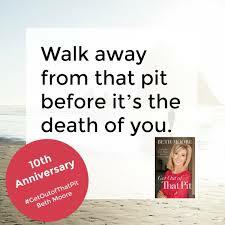 Beth just rereleased Get Out of That Pit for it's 10th anniversary. I had read it before when it was initially released, but decided I could probably stand to read it again. I read a lot of books, around a hundred a year. I don't always remember every detail of them, but I did in this case. I remembered nearly every part of this book. I remembered it so well that I could tell you where I was sitting in my house ten years ago when I read different chapters. That tells you that it had a profound impact on me. I think this book is full of power. It is desperately needed still, a decade later. It is a current word to the church. I think so many of us in the body of Christ are ill-equipped in handling the misdeeds of others that we unintentionally shame them into a pit. How rare is the hand that acknowledges sin and still offers a hand up. 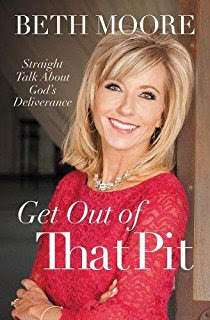 Now, one thing I love about Beth Moore is that she never wavers of her tireless preaching of the sovereign power of God. She makes no bones about the fact that we are unable to deliver ourselves. Only God can deliver us. She covers the several different ways that we get into pits and the only way we get out. Christ. I could identify with much of this book. I have been thrown into a pit and I have thrown myself into a pit. I lived there for decades. Recently, I realized that I had been feeling stuck because I spend so much time caring for others that my own body and soul were depleted. It's not the pit that child abuse threw me into or the one I threw myself into repeatedly as a result, but it was something I needed to see. I needed a hand up. I needed more time with my heavenly father. I needed reassurance of His love. A decade after my first reading, I learned a new lesson. I am a fan of Sophie. I like that she is talking about nothing and yet driving a point all the way home. I always appreciate the fact that she isn't trying to impress me with her great knowledge or holy wisdom. She just tells what God is teaching her with all the humility she can muster. I like it. Send me the straight shooters. I read this book when it came out and I liked it, but for some reason I decided to buy the audio at the end of summer. I think I had just made one too many long trips with three kids and the thought of driving four hours home almost took me out. I wanted to listen to somebody talk to me, somebody that sounded like family. It worked. I think it was divinely inspired because my four hour trip turned into over six hours and I arrived home no worse for the wear. It was like riding around with an old friend. I actually liked the book more the second time around. I think I needed to hear it more. I needed to be reminded of the importance of certain things. I was dog tired, worn bone thin, and hurting. So, I listened. I grieved. I went on. I loved hearing her inflections. It was soothing. Sometimes you want that person around you to remind you to love and be loved and the spot is empty. So, for this window, she was my person. I loved following her moves and life changes and hurts. Her story of encountering the Holy Spirit at a Christian school she got a job at was fantastic. She said, "These people were serious." I laughed so much. 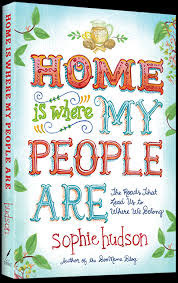 She talks about raising her son, troubles in marriage, and finding her place in the world. It was good for my soul to stop and hear her story. I listened to this in my suv, on my John Deere, and painting our three story house. We kept company and it was grand. I loved it so much, Sophie. Thank you. Almost all of the books you see on my blog are given to me by the publishing houses for review. This one was paid for by my man, Denb. Thanks, Boo.